Hoffman introduces Utility Junction (UJ) Sectionalizing Enclosures, designed to provide aboveground housing for sectionalizing, tapping or terminating underground distribution systems while resisting challenging outdoor conditions. 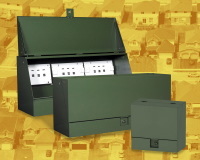 UJ enclosures are offered in single- and three-phase models. With resilient steel or aluminum construction and a tamper-resistant design, UJ enclosures withstand the toughest environmental abuse to deliver extended operational life and minimize replacement costs. Each UJ enclosure features a self-engaging wind stop that holds the cover in the open position for easy access to terminations. A recessed pentahead latch and interlocked padlock provision ensure the enclosure closes securely. The UJ enclosures, now available in a variety of standard sizes, also meet ANSI C57.12.28 Pad-Mounted Equipment Enclosure Integrity industry standards, Hoffman says. Each of the 15 UJ enclosure models is available in large or small orders with short lead times, providing the convenience of in-stock solutions with the flexibility to meet diverse application needs.